Interfaith marriage has a higher rate of failure than same-faith marriage. If you love him but his faith is different than yours, is it worth the risk? Should you pursue an interfaith relationship? 1. There are too many challenges. 2. Interfaith marriage is less satisfying than single-faith marriages. 3. The sleeping time bomb. 4. Being in an interfaith marriage can weaken your religious beliefs. 1. Be Knowledgeable about Your Partner´s Faith. 2. Learn to Communicate Better. 3. Come Up with Remedies to Potential Issues Early. a.) There will be no pork and seafood allowed in our house. b.) He would come with me and our children to church services every Sabbath. c.) Our children won´t be baptized in the Catholic church, or in any church, as babies. d.) My husband can take our children to the Catholic church-services by himself. 4. You have similar values. How is it going for us so far? I received the eBook. Thank you so much. I like the fact that you included God in your search for love. So many of us try to exclude God from our lives and expect to find any happiness or love and that just doesn’t work. My question is if its okay to have an interfaith marriage? The man I am dating is Christian but I am a Hindu and I love Krishna so much. Can our relationship work out? Most of the time we find that we are very devoted to God and we don’t really clash. I admire his devotion and he admires mine but at the same time we are worried about how our families will react to the news. ~ Miss M.
Interfaith relationship is likely to work if one or both of you are not deeply religious and you are able to meet at a certain level of compromise. It is unlikely to work if one or both of you are devoted to your own faith. 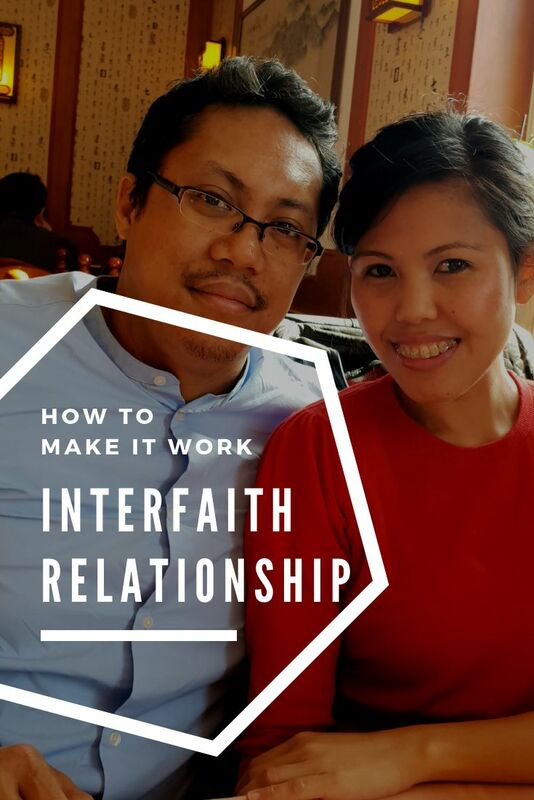 Relationship and marriage are already complex, add to that the challenges of being interfaith and you´ll understand why interfaith relationship is not advised by many and frowned by some. There are some dating or relationship coaches who think that pursuing an interfaith relationship is just not worth it … and they may be right. When two Christians from different denominations marry, even if they worship the same God, their clashes will come from different interpretations of the scripture and different denominical cultures. Different Christian denominations have different sets of beliefs arising from their different interpretations of the passages in the Bible. Some Christian denominations are theologically conservative, while some have adapted a more secular approach to Christianity or even incorporated some (if not many) pagan practices. One spouse may look forward to celebrating Christmas, or egg-hunting with his kids on Easter, or scary tricks on Halloween, while the other spouse does not believe nor observe those celebrations. That leaves conflict and awkwardness for everyone in that relationship. One spouse may teach his children about the purgatory and the soul going to heaven right after death (Catholic), while the other spouse may teach the children that there´s no purgatory and that death means a long sleep in the grave, waiting for Jesus´ second coming (Seventh Day Adventist). One spouse may talk about the Great Design, God being the Creator, while the other spouse believes in evolution (not everyone who believes in evolution are Atheist). Or one spouse may keep the Sabbath, the seventh day of the week, while the other spouse keeps the first day. But then again, that´s only within the inter-Christian-faith. How much more clashes and differences are there between Hinduism and Christianity? Praying together, attending church services together, going to church-related outings and camps together, are crucial bonding moments for couples and families. But interfaith couples are rarely able to enjoy these. Overtime, the missed bonding opportunities will cause resentment and dissatisfaction in the relationship. If you care so much about your faith, it´s only normal to want to be able to share it with your spouse. It´s difficult to achieve that if your spouse has a different set of beliefs. In times when you face spiritual crisis, you wished that your spouse can be your rock, to help you up and inspire you to be strong spiritually again. But while your spouse can be your rock in other areas of your relationship, he won´t be able to provide you that in the spiritual area. And this goes vice-versa. In order to achieve harmony in an interfaith marriage, one person tends to bury their faith so that their spouse can have their own faith be a prominent part of their life. The problem is that “when you bury something that is really important to you, all you’re doing is building up a kind of pressure within the family relationship, which becomes a source of tension, which ultimately becomes a time bomb. If there’s any reason why intermarriages break up, it’s because of that time bomb.” Egon Mayer, USA Today. Spending more time with someone who has a different faith can negatively impact your own faith. It´s difficult to meditate, or to focus your thoughts to God when there are so much clashes and differences within your own home. Overtime you will realize that you are not where you used to be, or that you are not where you want to be in your spiritual journey all because you´ve been busy balancing all the faith-based differences in your relationship and that you have to compromise so much of your faith in order for this to work. Some interfaith relationships are doomed from the start, while others have better chances. Although an interfaith marriage is too risky, there are also many who were able to make it work. So what does it take to make it work? It´s true that love is blind, but if you dive into an interfaith relationship not aware of what you are getting or not orienting yourself fully about your partner´s religion, you´ve got a problem. Thankfully, there are statistics available in the internet that identifies which interfaith unions are likely to survive and which ones are most likely to fail. Read: 21 Intriguing Interfaith Marriage Statistics and Divorce rates among mixed marriages. Some studies have shown that interfaith couples are better in communicating effectively and coming to an agreement about important issues than same-faith couples. This is probably because starting from the beginning, you know that this is going to be very complicated so you double your effort in discussing issues and conflicts that will arise in the future and how to remedy them. I know this is true because this is how my husband and I approached our interfaith relationship from the start. We discussed everything. We laid everything down on the table — every differences, every challenges, and we identified how to remedy them and when to compromise. I`m a Seventh Day Adventist while my husband is a secular Catholic. I grew up in a conservative religious home while my husband grew up in a non-religious home. He is not a devoted Catholic and there are many beliefs and traditions in the Catholic church that he does not believe nor observe. The fact that my husband is non-religious and non-devoted made our interfaith relationship easier because had he been, there would be so much clashes in our union. We started discussing about the challenges of our potential interfaith relationship long before we officially became exclusive. We didn´t wait to be in a relationship before we discussed the issues, we did it right away. This allowed us to weigh things very well, to approach our relationship with wide open eyes, as well as identify how much compromises we were willing to make. As a Seventh Day Adventist I keep the Sabbath, which is the Saturday — the seventh day of the week — holy. I don´t eat Biblical unclean foods such as pork and seafood. We don´t baptize babies. In our church we only baptize adults or young adults who have made the decision to accept Jesus as their Savior by themselves. These were the top three non-negotiables for me. I also expressed to my husband — then my pursuer — how important it is for me to have a family that worships and prays together. My husband went above and beyond by voluntarily offering that whenever I or our future children would be with him, he would not eat Biblical unclean foods. It´s been almost ten years since we got married and my husband has been true to his words, never begrudgingly. He embraced a non-Biblical-unclean-foods kitchen with me. When we´re dining out or attending parties, he also abstains from pork and seafoods, just as he promised. However, there are times when he couldn´t resist the shrimps, and he´d lovingly ask me if it´s okay if he´d eat. To me it´s okay. For the first three years in our marriage my husband did accompany me to church services every Sabbath. In fact, he did something very loving which will forever stay with me. When I was new to Germany in 2011, I could hardly speak German and I had no friends. I moved to this country to join my husband who is a Filipino (just like I am) but who grew up here and is a German citizen. Without my knowledge, my husband searched for the SDA church in the city over the internet and visited it himself during the week. He spoke with the church elder and his wife during his visit. I was so touched by what he did for me. In the next three years my husband was my constant companion to church, until I made a mistake which prompted him to stop coming with me regularly. I signed him up for Bible study every Saturday after potluck — without his consent. It started as a way to answer his many questions about the Bible and our beliefs. But then the elder who handled his Bible study became aggressive in pushing the Bible study on him which left my husband feeling trapped and isolated. Every Sabbath we have potluck in our church, but after food instead of joining me for camaraderie, my husband was being ushered to a different room for Bible study. He was not happy coming with me anymore, which I understand. I accepted his decision. Faith or religion is something you don´t force on people. Now, my constant companion to church is our son. My husband only joins us once in a while or when we have inter-church fellowships. Our children will be raised predominantly as adventists but they will be the one to decide for themselves which church or religion they want to join and be baptized for once they become adults. Until they´re able to make that decision for themselves, they won´t be baptized. My husband did not have any problem about this. But his mom, who´s a devoted Catholic, did. Unfortunately for her, this is something not hers to decide. Since Seventh Day Adventists don´t baptize babies, I had no issues about this at all. Although ours is an interfaith relationship, we pray together as a family. We´ve been doing this from the very start — before we eat, before we sleep, and when we´re facing life´s challenges and making crucial decisions. Most of the time it´s me who prays for us, my husband only kneels down with me, and that makes me the prayer warrior for our family. However, whenever we´re facing crisis or we´re needing God´s guidance big time, I pray first and then my husband prays next. One of the crucial things that make our relationship work is having the same values. We both believe in God, we both are family-oriented, we both believe in the importance of integrity and respect, we both believe in loyalty and faithfulness in marriage. We both believe in hard work and in becoming good stewards of our finances, we both love to travel but are also homebodies, we both are rooting for a successful marriage, and we both believe in the need for making compromises in order for our marriage to work. Almost twelve years since we met and almost ten years since we said “I do” + a kid in the mix we are still going strong. Were there days when I wished I had a same-faith marriage? Yes, for sure! But were there days when I wished I married someone else? Never, for sure! Our interfaith marriage isn´t perfect but so are many same-faith marriages. What drawn me to my husband from the very beginning were his values, him being a good and honest man, him being a gentleman, him respecting my boundaries and waiting until our wedding night before we could make love for the first time (as I had always wished), his belief in God, and his love for me so big he was willing to move mountains just to make our relationship work. That was something I have never seen from any single men in my church when I was still single and looking. Most importantly, long before I met my husband, I`ve always prayed for God´s guidance. It didn´t take long after I met my husband when I saw the signs that he was the one for me. Thankfully both our families were supportive of our relationship. There were no judgment or oppositions, which I believe is integral for a successful relationship. How each of your family will react to your relationship can be a telltale sign if it´s worth the risk.